"This is the second draught test hosted by WNAG which combined a day of tests for the Newfoundland Club and a day for the Southern Newfoundland Club, an arrangement that seems to work remarkably well. We had a total of 25 dogs tested over the weekend, 11 tested on the Saturday (NC) and 14 on the Sunday (SNC). The highest Level teams entered was at Level 2, with 4 successful passes out of the 6 entries, over the two days. Level 1 saw the largest entry on both days, again we had a brace entered, these two brothers are a pleasure to watch, they work well together and a lovely almost faultless pass was obtained. WNAG would once again like to thank Bryn Bach Park management for allowing us to use the park; it is a superb venue for a draught test at all levels. I look forward to seeing the teams progressing in the future, so they can enter the higher levels and fully appreciate the challenges that the park terrain has to offer. I would also like to thank 'Team WNAG', judges and stewards for all their hard work, in particularly Bev and Desna for the superb catering and hospitality; lastly thank you to all who entered our tests, without you it couldn't have gone ahead, I hope you all enjoyed the weekend and look forward to seeing you again next year." "The weather at Bryn Bach wasn't too unkind to us for the 2nd WNAG hosted draught test of this year. On the whole just a bit chilly and a little sticky underfoot. Such a lovely venue to hold draught tests with plenty of different surfaces and environments to test all levels and beautiful scenery to enjoy whilst you spend a lovely weekend at the event. We only had one entry in the beginners level today but our team did not let us down, a lovely test with both dog and handler working well and enthusiastically together. Well done. I'm sure next time you will achieve your Level one with ease. I would like to take this opportunity to thank WNAG for hosting this test. I know how much work is involved in setting up and running any sort of event but this work usually ends up being overlooked by most so a big thank you to Kay Burridge, our test manager, Bev and her helpers in the kitchen and everyone else who helped make this event another outstanding success for team WNAG." 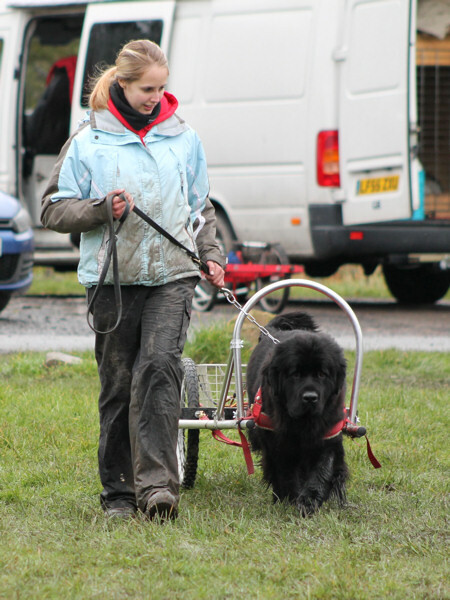 "We had a rather soggy day for our second day of tests at Bryn Bach, however that didn't deter entrants as we had 11 dogs entered, one retired himself by leaving the ring and another was a bit nervous and so again was retired at the first stage. All the others did very well and proceeded to the manoeuvring section. Other than another retiree (probably objected to so much mud by this stage) eight dogs went on to the final section and all passed with flying colours. Thank you so much for the hospitality and fabulous organisation. A big thanks to my co-judge Jude Moulsdale and to the stewards."